Our Judaica online web store features a full array of Judaic gifts including Yair Emanuel Judaica plus gifts, art, Jewish jewelry, synagogue furnishings and gifts for the entire holiday and life cycle of events in Jewish life. When you shop with us you’re doing a lot more. First of all, not only do we carry over 22,000 items and growing daily. You get great selection and it’s all in stock with our state of the art system. Furthermore, and perhaps more importantly, is that you’re directly supporting Israel and Israeli families when you buy Judaica here. Therefore, shop online for a fabulous Judaica gift idea & experience and enjoy the lowest discount pricing for the most exquisite gifts. The categories above will open up to a world of gift subcategories where you will be able to choose from the most beautiful products made in Israel shipped worldwide. We suggest some of our most popular gift departments. The Zion judaica from Israel department you’ll find wonderful gift ideas. Challah boards with matching challah covers are used on shabbat and holidays. Then a havdallah set with kiddush cup, plate, spice holder and candle holder is used for the ceremony after shabbat and a great thoughtful gift. Finally, candles for both Shabbat, Hanukkah, and celebrations are sold in it’s own department. Mezuzah cases and scrolls are available for a new home, a children’s room and a wedding gift. Shofars are ram horns for the holidays and a beautiful gift. Wash cups are used before every meal as per halacha. Shop for an array of shabbat candlesticks and candelabras with matching kiddush cups. House warming Judaica gift ideas might be a blessing plaque, and for the office, a business blessings. For celebrations, we carry a full array of personalized kippahs in every material imaginable and party favors and centerpieces. For the temple, you’ll find Synagogue furniture which includes Bimah tables, velvet covers, podiums, aron kodesh arks, Torah yad pointers and much more. Wow shop the most sought after Jewish Jewelry gift giving ideas around. We carry beautiful Jewish Jewelry for Women and Men. Find Star of David Necklaces, Chai Necklaces, Hamsa Necklace Jewelry, Kabbalah Jewelry, Evil Eye Bracelets, and Tree of Life Jewelry just to name a few. One of our most popular gift giving ideas are Hebrew Rings and Jewish Rings. You’ll be sure to find that perfect gift here. Especially relevant is this department by age and stage of Life. 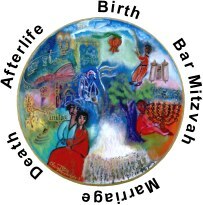 From New Born Births , Bar / Bat Mitzvahs, Weddings to Deceased we have you covered. A fabulous selection of New born baby gifts and Jewish educational toys. From Bris Pillows to Baby Shower Favors. Next is the Bnai Mitzvah stage. Find Bar Mitzvah Gift ideas, Bar Mitzvah invitations, and Bar Mitzvah Party Favor give aways. Likewise we carry Bat Mitzvah Gifts and gift ideas, Bat Mitzvah invitations and Party favors. The Jewish Wedding a very significant stage in the Jewish Life Cycle. Buy a Ketubah wedding contract, chuppah canopy, tallit , wedding gift ideas and Invitations. For the deceased we offer sympathy cards, velvet Jewish casket covers and memorial candles. In addition to all year round, there are the Jewish holidays. Always a pleasure to get a gift for the upcoming Jewish holiday. Certainly a beautiful display in your breakfront be it an art piece or functional piece. Jewish holiday gifts are just for the holidays. Consider the popular Seder Plate gift for a new couple or a Purim Scroll for the Groom. Another Judaic gift giving idea is an authentic Megillah Scroll & Case for Purim or a Menorah for Hanukkah. All are thoughtful gifts to give and get throughout the year. Visit our Jerusalem Gift department. You’ll be amazed at the beautiful Israeli creations that are just amazing Israeli innovative gifts and decor for your home and office. Noteworthy, gifts for him and her can be found respectively under their categories. We’ve chosen specific gift ideas with a Jewish or Israeli flare that are sure to delight the Jewish man or women to receive. Thoughtful and delightful, these gifts carry meaning far beyond the product itself. Shop our store with confidence. You will automatically be forwarded to our parent store ahuva Judaica store for checkout. Therefore, don’t shop anywhere else. We want your business and we go the extra mile to satisfy you with your purchase in every way. Try us out. In conclusion, there is no other store like us in Israel or around the world. Mezuzah, Sports, Resin, 4 1/2"
Mezuzah Syn The Altneuschul-prague, Resin, 4 1/2"
Mezuzah, Florence Synagogue Replica, Resin, 4 3/4"
Mezuzah , Fortress Synagogue, Resin,4 1/2"